Maria's taken the classic meatloaf recipe we came to love as kids up a few notches to make it a truly memorable gourmet dinner. This recipe adds a delightful mushroom sauce with a dash of sherry to really bring out the delicious flavors in this traditional meal that dates back to Roman times. Served with mashed potatoes. Ground sirloin, ground pork, ground turkey, bacon, parsley, onions, mushrooms, worcestershire sauce, bread crumbs, egg whites, milk and spices. Very good and just pop in the oven! I can buy a tastier meatloaf at Spouts for about $8 and I make much better mashed potatoes. Not going to order this dish again. But still love Maria's! Easy to prepare, great tasting! The gravy made it yummy. Thanks! Yummy comfort food. The mashed potatoes were a big hit with me. 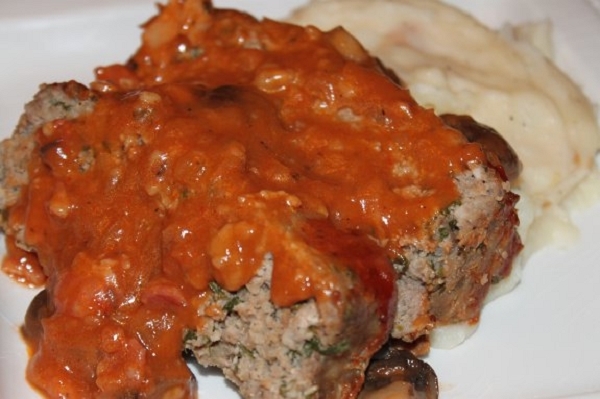 Very tasty Meatloaf ! Just enough red ketchup sauce on very moist meatloaf. Used the mushroom sauce on the delicious mashed potatoes. Enjoyed a very nice meal. This was really, really good, but strickly meat & potatoes! Firm meat full of flavor and the sauce was really great too :) The potatoes were really good and came with a nice topping, and the sauce/gravy for it was really tasty. You need a salad with it though to round out the meal. I love meatloaf and this stood up to my standards, I couldn't wait to have the leftovers the next day. this was my first order it won't be my last. I didn't love the sauce. Kind of watery. :/ Meatloaf needed a little more ketchup topping. The mashed potatoes were delicious! Maybe also serve with a vegetable? The meatloaf was good and the mashed potatoes were fantastic, but I didn't care for the sauce. 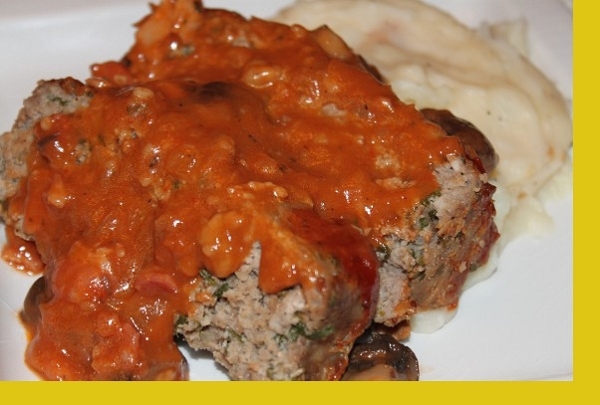 This meatloaf was very tasty but I wanted more mushroom sause. Mashed potatoes were amazing. I really enjoyed this meatloaf. It is tasty and so easy to cook. One of my favorites. Loved the meatloaf and the sauce was fantastic. I'm not normally a meatloaf person, but this was so good. The sauce was a great added touch. My husband is not a meatloaf eater, but I asked him to try this. He really liked it! Excellent portions and so very good! My family and guests enjoyed the dinner. The mushroom gravy was excellent with lots of mushrooms. The dinner portions were nice as well. We thoroughly enjoyed it, and recommend it very highly!